At the end of the three-year implementation period, the European Union Agency for Railways will become a European authorising authority from mid-June 2019 according to the technical pillar of the fourth Railway Package. This article will describe the extensive actions that the Agency is taking to prepare for the new tasks together with all stakeholders. These measures are proceeding largely according to plan, while there are major uncertainties regarding the transposition into national law of the legislative package, as the member states do not have to announce their relevant implementation dates until mid-December. The technical pillar of the fourth Railway Package [1–3], effective as at June 2016, is without doubt the most important legislative initiative in the history of the railways in Europe – for the first time it will enable a European authority (the European Union Agency for Railways, ERA) to issue vehicle authorisations and safety certificates valid throughout Europe and will fundamentally change the relationship between rail infrastructure managers (RIUS) and Railway Undertakings (RUs) with regard to the use of authorised vehicles. This is a major step towards a standardised European railway area, towards an integrated market environment with clear, standardised rules, monitored by ERA and implemented in close collaboration with the national safety authorities (NSA). The new rules should also help to revitalise the rail sector and strengthen its essential safety benefits. Less than a year before the end of the transitional period for implementation of the technical pillar (16 June 2019), ERA is on the sprint to the finish. 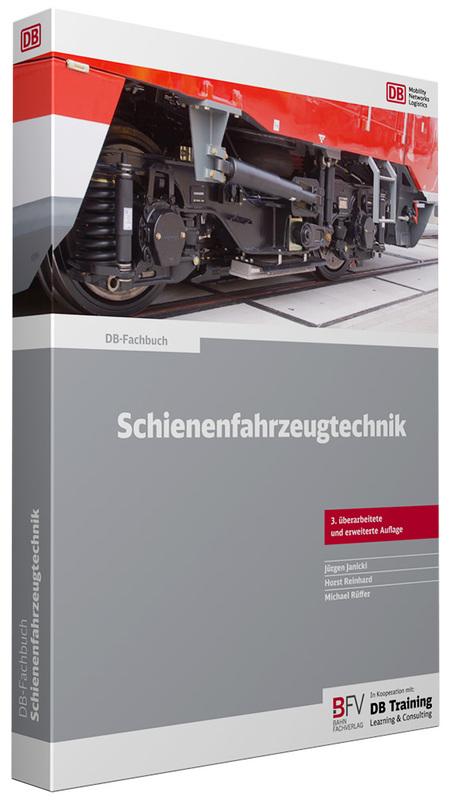 This article will describe the state of implementation of the technical pillar, in particular how the Railway Agency is preparing for its new, extended tasks and what tasks are still to be completed by the end of the implementation period. The process of liberalisation and harmonising of European rail transport which began in the 1990s will provisionally be concluded with the fourth Railway Package. The legislative package of the technical pillar that was adopted by the European Parliament in May 2016 consists of three texts, the recasts of the Railway Agency Regulation, the Interoperability Directive and the Railway Safety Directive. [1–3] The regulations entered into force on 15 June 2016 following publication of the legislative texts in the Official Journal of the European Union. The new legal provisions go hand in hand with the creation of a central point of contact designated a „One-Stop Shop“ (OSS) to which all applications of this type have to be submitted. This new information and communication system operated by ERA will make the process convenient and transparent (Figure 1). The problems with the authorisation of rail vehicles in various European countries that arose at the beginning of this decade are still resonating here: in Germany in particular, the subsequent „round table“ discussion process has led to a practicable solution, but this is limited to the national area. The fourth Railway Package will provide a very flexible solution. On the one hand, progress made at national level will be transferred to Europe, insofar as this is permitted by the new regulations; and on the other hand, in purely national cases the applicant can decide whether to contact the Agency or the relevant national authority as the authorising authority. If the area of application covers more than one member state, the application must be submitted to the Agency. 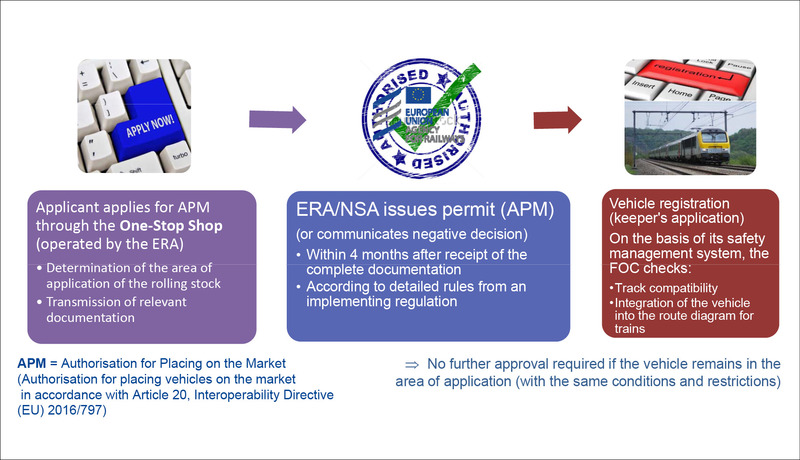 In any case, the application for vehicle authorisation must be submitted via the Agency’s one-stop shop, and the same standardised procedure as shown in Figure 1 applies to both the national and the European process. The main differences between the process shown in Figure 1 and the situation according to the third Railway Package are: the authorisation for placing on the market for vehicles mentioned above replaces the authorisation for placing vehicles in service, and mobile subsystems do not require a separate authorisation with the fourth Railway Package as the authorisation for the vehicle also covers all its mobile subsystems as well. National safety authorities may issue temporary authorisations to use the vehicle for practical tests on the network. 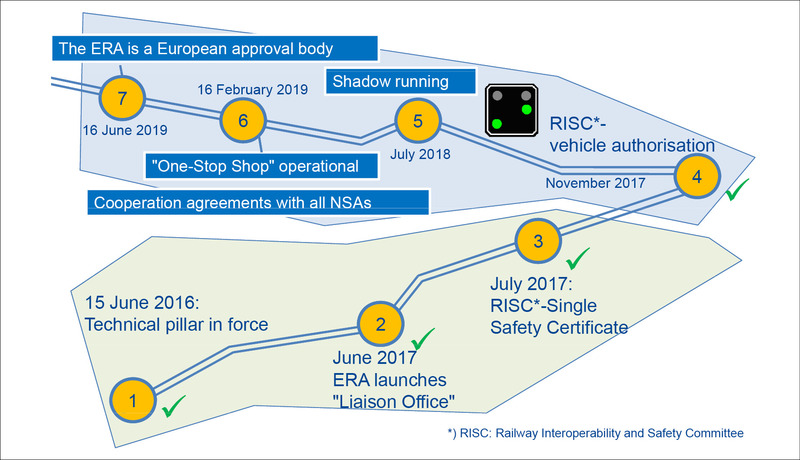 The new procedure for vehicle authorisation is described in detail in an implementing regulation, which was adopted after several years of intensive coordination with the rail sector and EU member states in November 2017 in the competent Railway Interoperability and Safety Committee RISC. In order to achieve economies of scale and reduce administrative burdens,  and  provide for a vehicle type authorisation  to enable the applicant to manufacture a vehicle series based on the same type, and to facilitate the authorisation of these vehicles. The implementing regulation distinguishes between different types of vehicle authorisation: initial authorisation (individual vehicle and its type), re-authorisation (individual vehicle and its type), extension of the area of application (individual vehicle and its type) and subsequent authorisation (individual vehicle after type authorisation). It is important to note here that applications for vehicle authorisation submitted to ERA must be forwarded by the Agency to the NSA for the purpose of checking compliance with national rules. The Agency itself verifies compliance with the Technical Specification for Interoperability (TSI). The annex to the vehicle authorisation implementing regulation describes the necessary scope of documentation and testing. The Agency will establish guidelines describing and explaining the requirements of the regulation. These guidelines will also include models developed by the Agency in cooperation with the NSAs. A series of workshops were held with representatives of the sector and the member states in order to develop these guidelines, the last being held in July. To implement the process described in a meaningful way, it is essential to streamline the multitude of national rules in order to ensure the success of the fourth Railway Package. Besides the resulting inconsistency, these rules involve a risk of insufficient transparency (with the associated risks for the applicant) and concealed discrimination against new market participants. ERA has therefore been working intensively on an action plan since the beginning of 2016 in order to reduce and simplify this. Figure 2 shows the situation using the example of the national technical regulations for vehicle authorisation. Starting from 14,000 such rules as of January 2016, a significant adjustment has already been achieved in 19 countries: by June these 19 countries together have only about 900 national rules. Extrapolated to all member states, this will result in about 1,200 national rules, which corresponds to a reduction by more than a factor of 10. 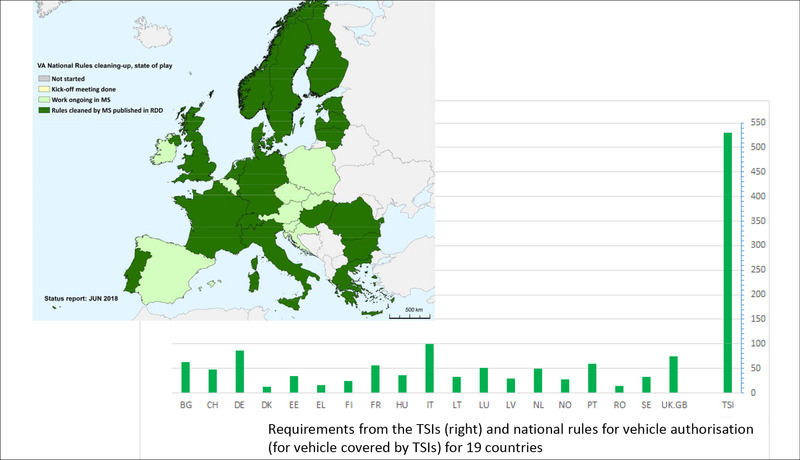 Figure 2 shows another interesting aspect: there are around 530 relevant rules laid down in the TSIs, while the maximum number of relevant national rules is around 100 – this example illustrates the progress made in respect of „Europeanisation“. A significant contribution to further harmonisation is expected from the further development of the TSI for rail operations (TSI OPE). A set of harmonised operating principles will be drawn up in this regard and further national regulations can subsequently be eliminated. One critical aspect of the introduction of the new authorisation procedure will be to ensure the efficiency and conformity of what are known as the Notified Bodies (NoBos). To this end, the Agency will provide suitable procedures to ensure both quality and trust between the institutions involved. This includes accreditation and recognition of assessment bodies, as well as audits and inspections of NoBos, taking into account consistency, simplification and proportionality. The process proposed by the Agency was approved by ERA Management Board in mid-2017. The fourth Railway Package brings another novelty – checks before the use of authorised vehicles according to Article 23 of . Before using a vehicle in the area indicated in the authorisation (see also Figure 1), a railway undertaking will ensure that the vehicle is properly registered after the authorisation, that the vehicle is compatible with the route (on the basis of the infrastructure register, the relevant TSI or other information to be provided by the infrastructure managers free of charge and within a reasonable period of time) and that the vehicle fits properly into the composition of the train as part of which it is to form part. At present, a number of member states still require a separate access authorisation by the infrastructure manager after vehicle authorisation – Article 23 fundamentally changes the roles, the decision/responsibility therefore rests with the railway undertaking, the infrastructure manager is obliged to provide the necessary information. The Agency has worked with the European Commission’s Directorate General for Transport and Mobility (DG MOVE) and the sector to define a clear distinction between authorisation and route compatibility checks. In principle, any aspect that can be defined in rules (TSIs or national rules) is subject to the authorisation procedure. Figure 2: Progress in reducing national rules using the example of technical rules for vehicle approval. In June, 19 countries published their revised rules in the RDD („Reference Documents Source: ERA Database“). The procedure relating to the Single Safety Certificate (SSC) is the same as for vehicle authorisation, in accordance with the fourth Railway Package. Again, the applicant has a choice if the geographical area of activity is located in only one member state, ERA has mandatory responsibility for operations in more than one member state. When the Agency acts as an authorising entity, the applicant will have the right to submit its application to the Agency in one of the 24 official languages of the Union. In addition, during the evaluation process, NSAs have the right to send the Agency documents relevant to the evaluation in a language of their member state without the need for translation. It is important to note that on the one hand, the technical pillar gives the Agency the ability to issue vehicle authorisations and safety certificates. On the other hand, however, supervision remains with the national authorities (NSAs) in any case. In this way, the Agency forms part of a team consisting of the national safety authorities, national accident investigation bodies, operators and ministries – and this team must work together closely to achieve smooth operations and substantial progress in respect of safety. In order to ensure an efficient exchange of experience, the NSAs and the Agency should swiftly exchange all relevant information in this context. The new vehicle authorisation and safety certification rules will apply from 16 June 2019, but member states may notify the Agency and the Commission that they will extend the transposition period and subsequently continue, for example, to issue vehicle type authorisations and/or authorisations for placing vehicles on the market until 16 June 2020. Two different legal regimes with different authorising authorities may therefore coexist between 16 June 2019 and 15 June 2020. The relevant situation must be clarified, in particular where the intended area of application covers one or more of these member states. Given the importance of the European Railway Traffic Management System (ERTMS) for the development of the Single European Rail Area, and in order to avoid fragmented development of ERTMS, the technical pillar has also given the Agency the mandate to make decisions for authorisation of trackside equipment projects for ERTMS. 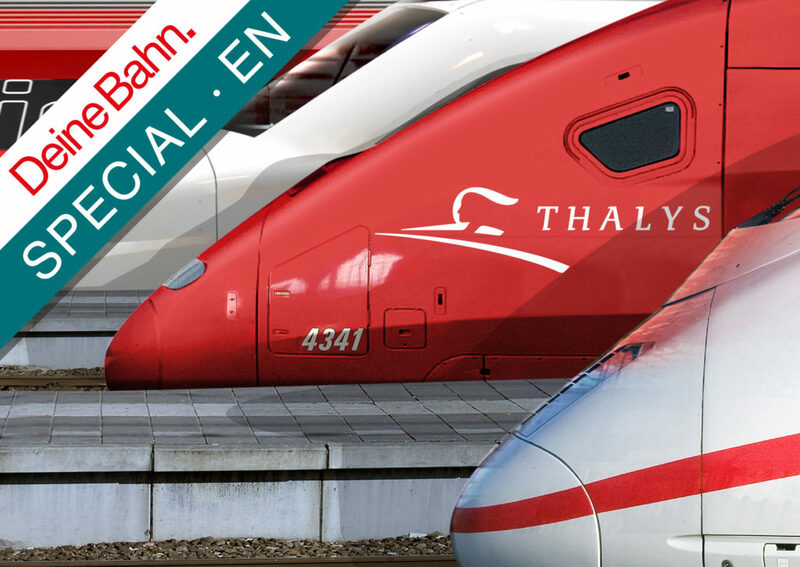 The mandate of the European Railway Agency has been extended considerably with the entry into force of the technical pillar in June 2016; and the fourth Railway Package makes the Agency an authority that will issue authorisations and certificates valid throughout the EU after the three-year transitional period. This is why ERA, in close cooperation collaboration with DG MOVE, has set up an extensive programme which between 2016 and 2019 will reorganise the Agency’s entire organisation, create new processes and provide the necessary skills to enable ERA to fulfil its new role, particularly as a decision-maker in the Single European Rail Area. Preparation for the implementation of the fourth Railway Package requires goal-oriented teamwork by many stakeholders: the project can only be implemented by the Agency together with the European Commission and the national authorities of the member states. The basic roadmap for the preparation of all participants and the introduction of the new procedures is shown in Figure 3. This diagram shows that the preparation programme is now entering its final phase – all the basic documents were available by the middle of the year. The Agency implemented a new internal organisation in July. The main change with this new structure is the creation of a department for planning, authorisations and project implementation. All operations in this department will be implemented in accordance with the Agency’s new mandate. The regulations of the technical pillar of the fourth Railway Package provide for what is known as „shadow running“ for the new processes (vehicle licences, safety certificates) one year before the end of the transitional period, from the middle of this year. With this shadow running, the agency is to test the new rules, in a practical environment, with concrete authorisation procedures still taking place under the responsibility of the national authorities. The first requirement for successful launch of shadow running is the existence of all basic documents in an approved form – this requirement is fulfilled as mentioned. The IT portal One-Stop Shop (OSS) must also be made available. In cooperation with the European Commission, but above all with the national authorities and taking into account the experience gained there and from what are known as „learning cases“, a functioning tool, supported by appropriate documentation, had to be available by the middle of the year. A product version of the OSS that meets the requirements of shadow running is currently undergoing internal tests at the Agency and will subsequently be made available to stakeholders as well. The findings from shadow running will of course be incorporated into the further development of the OSS. The third requirement is the organisation of the Agency, in terms of both structure and the necessary abilities of staff. The experience gained in other areas (aviation, shipping, etc.) at the relevant agencies (EASA, EMSA, etc.) has largely been incorporated into the design of processes and procedures at ERA. The experiences of the existing authorisation procedures on the one hand and the practical findings from the learning cases on the other had to be used in order to develop the common European process for vehicle authorisation and migrate the procedures in the member states there. In mid-2017, the Agency established a liaison office for this purpose which currently manages more than 20 specific future authorisation projects. These learning cases are helping to prepare applicants for the new procedure with a new European authority, and providing ERA staff with experience as well. The simplification of the framework conditions resulting from the new TSIs and the resulting reduction in the number of national rules must also be taken into account. In the light of the experiences of the national safety authorities with the authorisation process, making early contact with the applicant in the form of coordination actions („pre-engagement“) has proven to be best practice in order to promote the development of relations between the parties involved in the vehicle authorisation process. According to , the Agency should offer such pre-engagement before applying for vehicle type authorisation and/or market launch authorisation for vehicles so that the authorising authority and the NSAs responsible for the area of use can familiarise themselves with the project. Another aspect of the pre-engagement is the stipulation of the regulations relevant to the authorisation. According to the Regulation , the vehicle authorisation agency will offer the pre-engagement process as of 16 February 2019. Relevant fees  will be charged from that date, while the learning case phase will be free of charge to the applicant. The preparation of the Agency for its new tasks has so far proceeded largely according to plan; thanks also to constructive and open cooperation with representatives of stakeholders, national authorities and the European Commission. The Agency must conclude formal cooperation agreements with the NSAs of the EU member states before it can perform its new tasks. To this end, in June the Agency’s Management Board adopted the guidelines and the list of the main elements to be included in these cooperation agreements. The negotiations currently under way between ERA and the NSAs are being conducted on the basis of these guidelines. Another aspect to be taken into account in these negotiations is the Pool of Experts. With the help of a competence management system, the Agency will be able to call on experts from this pool if necessary. The Agency itself will increase the number of employees by around 30 by the beginning of 2019. An appropriate selection procedure which takes into account both technical skills and language skills is already well advanced. In January 2019, amended TSIs for rolling stock (TSI LOC&PAS, TSI WAG) and for Control Command and Signalling (TSI CCS) will be put to the vote at the Railway Interoperability and Safety Committee, RISC. It is essential in this regard to define the „basic design characteristics“, and in particular the degree of change to these design features that will require new authorisations. Publication and subsequent entry into force of these new TSIs may therefore take place well ahead of June 2019. Comprehensive and targeted information for all parties involved is of great importance: there are still uncertainties among many potential applicants, especially smaller companies: how can existing vehicle authorisations be implemented in practice by the RUs from June 2019 after technical modifications? How is the exact process flow structured? How much expense and effort will be required from applicants? How great is the risk in terms of delivery deadlines? The Agency, with the support of the NSAs, sent out questionnaires (translated into all national languages) in the spring in order to assess the level of information and the state of preparations in all member states. The aim was to identify which organisations would benefit from targeted information, the areas in which the greatest difficulties exist, and where there was an acute need for action. Nearly 450 of these questionnaires were returned, almost 60 per cent of which were not anonymous. Overall, national organisations (NSAs, infrastructure managers) and larger organisations generally consider themselves to be well informed, while smaller companies have considerable gaps in information in some cases – 47 per cent of respondents stated that they did not understand the implications of the technical pillar sufficiently, while 12 per cent said they did not know about the technical pillar. On the basis of the detailed evaluation, the Agency will hold a series of information events starting in the fourth quarter, again in close collaboration with the NSAs. Additional basic information is available on the Agency’s website under „Frequently Asked Questions“. One uncertainty that is difficult to assess at this stage is that the member states have the option of applying to the European Commission for a reasonable justified extension of the implementation period for the technical pillar of up to one year until 16 December. Hence there is no clarity as to which member states will actually be subject to the competence of the Agency as an authorisation authority from 16 June 2019, and which will not. The Agency and the European Commission have accepted that the technical pillar will have been transposed into national law in the majority of significant member states by June 2019. Despite the significant changes resulting from the technical pillar of the fourth Railway Package, the Agency is approaching its new tasks with great confidence. The aim of the fourth Railway Package is – as desired by the sector in Europe for many years – to bring about lower costs (only one procedure with one authorising authority), greater transparency (a standardised procedure throughout Europe), better planning capability (due to coordination in preparation), lower risks in project execution, more convenient extension of the area of use and clarity with regard to cases in which new authorisations are required. As with all major changes, initial difficulties cannot be ruled out. It will be important to ensure that any problems are resolved quickly in constructive collaboration between the parties involved. Directive (EU) 2016/797 of the European Parliament and of the Council of 11 May 2016 on the interoperability of the rail system within the European Union. Directive (EU) 2016/798 of the European Parliament and of the Council of 11 May 2016 on railway safety. Member states have the option of applying to the European Commission for a reasonable extension of the implementation period of up to one year (i.e. up to 16 June 2020 at the latest) until 16 December 2018. With a total of six legislative texts, the fourth Railway Package consists of two pillars, as they are known, which were negotiated simultaneously: the technical pillar in question and the „market pillar“, which includes (1) a regulation awarding public service contracts for domestic rail passenger services, (2) a directive opening up the market for domestic rail passenger services and the management of railway infrastructure („governance directive“), and (3) a proposal to repeal an old regulation on state aid to freight operating companies. The market pillar was adopted by the European Parliament in December 2016. The NSA for Germany is the Federal Railway Authority (Eisenbahn-Bundesamt, EBA). Commission Implementing Regulation (EU) 2018/545 of 4 April 2018 establishing practical arrangements for the railway vehicle authorisation and railway vehicle type authorisation process pursuant to Directive (EU) 2016/797 of the European Parliament and of the Council. RISC – Railway Interoperability and Safety Committee, with voting representatives from all member states. The vehicle type indicates the design applicable to all vehicles of that type. With regard to vehicle types, the terms „variant“ and „version“ have also been introduced in order to allow for different configuration options or changes during the life cycle of a vehicle type. The difference between a variant and a version is that variants have to be approved, but versions do not.